First, A Big Shout Out To DFS for sponsoring the event! 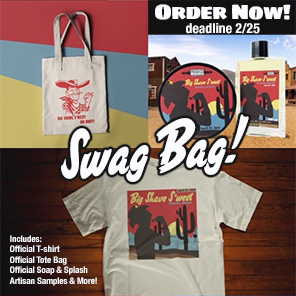 It's on people, Grab You Official Big Shave S'west Swag Bag NOW - February 25th is the cut off for Pre-Orders! Official Shave Soap will be done in our Ultra Premium CK-6 Formula! Now is the time to order The Official Big Shave S'west Swag Bag folks! These traditional shaving goody bags are a Big Shave Tradition! $49.95 gets you tons of samples, full size promotional items, the official shave soap (CK-6), splash, event t-shirt, canvas tote bag and more! We always over deliver in the swag bag dept and keep the prices low, so be sure to snag one while there's time! SIZES: If you have questions about size or need something larger or smaller, reach out to me and I'll see what I can do! This Years Scent is REALLY Special! Ahh 2019, the year of Musk! It's true folks, if you were to ask me for my 2019 prediction on New Years Day, that would be my answer. I have been observing subtle scent trends over the last few months and I truly believe we will see a return to classic musk scents. Sooooo, with that in mind I set to work on the Official Big Shave S'west scent and man, what a daisy of a classic, masculine, Southwestern Musk! If you don't know, white sage is huge out here and the most aromatic of all the sage. On a hot Arizona night you can smell it in the air, spicy and slightly camphorous. It is also used in many a Native American Ceremony. Clean, Fresh and Earthy and what some define as the Soul of The Desert. And then there is the Rosewood, a sweet, woody, fruity, floral aromatic. Comparable to sandalwood in some regard...I'll say Sandalwoods shy cousin but just as deep, if not more. White Musk is floral, woody and musky with a hint of animalic muskiness. When combined with the Rosewood & Sage a synergetic effect or reaction transpires! Lastly, I lovingly distilled some white sage and deer's tongue (Trilisa odoratissima) hydrosol! Now don't freak out, it's not actually Bambi's Tongue but a leaf high in naturally occurring coumarin which gives off a warm, sweet scent similar to Vanilla. Deer's Tongue is also, like Sage considered very sacred by many Native American tribes. When combined with the White Sage Hydrosol you have a real delicate balance of yin & yang. There is a real energy to be experienced in this blend and I could not be happier or prouder with the results! That said, I can't wait to see and meet all of you at this years event! Important: BSE Swag Bags Are ONLY AVAILABLE TO ATTENDEES - These Will Not Be Shipped! Swag Bags will be Picked Up at Event! So The Big Shavestill exists? Cool! Kudos to whoever kept it going. Is this PAA only or a multi-vendor / mult-retailer event? Dude, that's cool! A big shout out to you and the other sponsors for keeping this one alive.